I had a wonderful conversation with a friend yesterday and we talked about a process I have been doing for some time now. I begin the new year with two days of tapping into my soul’s desires and writing a Strategic Vision and then making a Vision Board that reflects what I wrote about. This is part of the process I did last year that lead to me creating an intention to go to be with the White Lions in South Africa, create a fundraising Blog and in April of last year I was there with the help, love and support of so many people. Instant manifestation once I was aligned with my heart’s desire. And I woke this morning to realized that the vision board I use every day in my meditation is focused on not what I want to be doing in and with my one life, but what I want to be feeling and how I want to BE in my life. So, I have decided to share this process with you and encourage you to use it and find it as part of how you manifest your dreams in 2012. Those dreams are only going to become real and vibrant in your life when each of us lives from the core of our own knowing and authentic self. This process connects you to this essential nature of you and helps you create a new and more energized relationship to be-coming who you truly are. Everything else you desire will follow your energy. So here is the two step process. Take time, turn off the phone, close the door and discover what your soul has been telling you all along. Write without restriction or censoring, a vision for this year as if it is ALREADY TRUE. Example: I AM 125 pounds and fit. I exercise each day and love my rebounder. I have learned to cook amazing and delicious gourmet vegan meals and share it with friends….or I have seen a credit counselor and all my debts are paid and I have money left over to invest in a new internet business I am so excited to be doing….I am loved and have friends who travel with me…I am so happy about the painting I am doing and I am sharing it by creating greeeting cards. The key is be VERY specific and detailed. The more details the better. Instead of saying that you want to snorkel in the ocean, say what ocean, where you want to snorkel and what you want to feel like it when you see whatever you are desiring to see. Cover every area of your life: How do you feel spiritually, physically, relationally, economically? Once you sit with the Vision, ask how it feels. Read it several times and claim it even if there is a part of you that has no idea how to achieve the desires. Every day spend 5 min. meditating on the board and FEEL what you would feel in every case. How would you truly feel in your body if you were fit and healthy, how would your feel if you had abundant money, love, or creative free time? Do this every day. 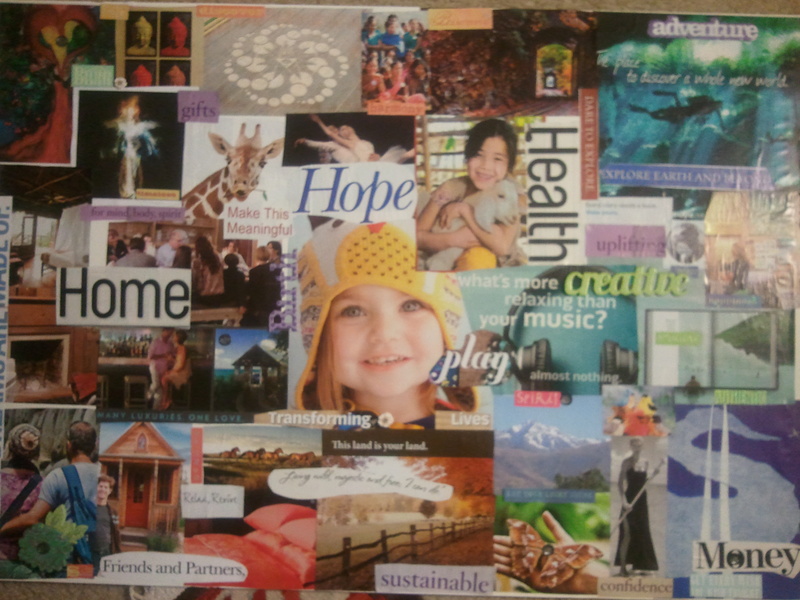 We all know about a vision board, but the trick is to USE IT. You will create a visual representation that you have to walk by every time you go to the kitchen or the bathroom and you take in the energy of the board deep into your subconscious. This board is very powerful if you pay attention to it. So, when you create it make it rich and vibrant and if you want nothing more in life than to live in the Taj Mahal then make it a big picture on your board. And by all means put some amazing music on and have fun and get glue and glitter all over you. Get magazines, travel guides, books of poetry you are willing to copy and cut up, colored pens, anything that you can find images and words to match your Strategic Vision. Your own design and method will just reveal itself. And please do not use just poster board, but get a board that is a thin press board and is sturdy and can be moved from room to room or hung if you wish. The most important thing about this process is to make it a sacred exploration of you, your desires and the images that move you. Take lots of time and realize with every word you write and picture you put on the Board you are creating your reality. YOU are creating your reality. So please, if you have thoughts or questions write me and by all means please share your vision with me and with as many people as you can. This entry was posted in Uncategorized and tagged Creating Your Reality, Law of Attraction, Love, New Year, Strategic planning, Strategic Vision, Vision Board.